Jet boating tours are hot right now as jet boating was invented in New Zealand and has become one of the most popular tourist activities alongside a plethora of others like rafting and bungee jumping. If you’re looking for something unique, slightly dangerous and thrilling on your next kiwi adventure then you can’t miss these epic jet boating tours. If you’re still on the fence as to what a jet boat is, picture an oversized jet ski capable of carrying up to 16 passengers down a river little more than a foot deep. Add rapids, rock faces, overhanging trees and 360-degree spins and you’ve got yourself a thrillseekers paradise. During my time in Aotearoa I’ve been on my fair share of jet boat tours and these are five of the best jet boating tours in New Zealand. 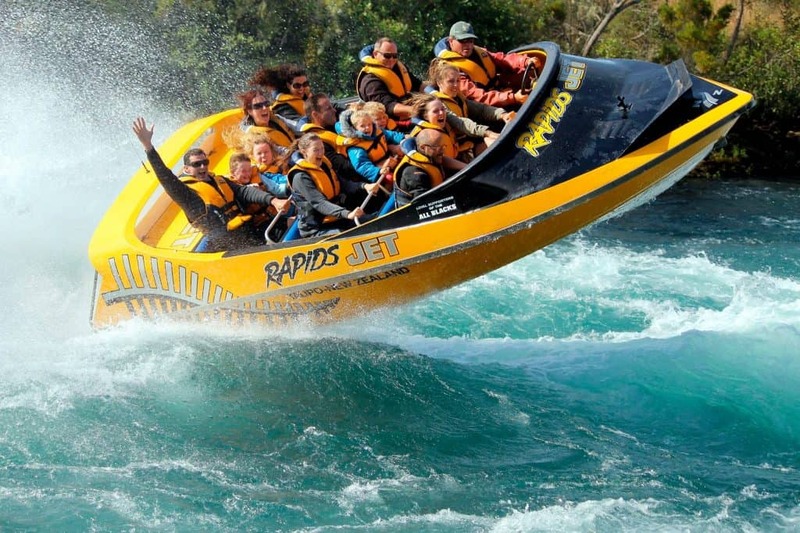 Starting with the best, yet least popular as they don’t have a huge marketing budget like the others below, Rapids Jet is New Zealand’s only white water tour. Located further up stream than Huka Falls Jet (below) you’re in for a blast as your experienced driver takes you on an unforgettable 35 minutes of fun aboard a 500HP V8 bright yellow jet boat. Prepare to get wet, as your jet soars into the air after hitting grade 3 and 4 rapids. Hold on tight as the driver performs their legendary 360 degree spins. If you’re prone to sea or motion sickness then this might not be the best jet boating tour as you’ll probably be spewing up half way through. If you do decide it’s too much they can arrange a 4×4 to take you back to base. With prices starting at $115 per adult and $65 for kids it’s a reasonably priced tour. They have photographers standing on the banks for those all important action shots that will get lots of likes on your Facebook profile. Why: It’s the best jet boat tour | Contact: +64 (07) 374 8066. No trip to Queenstown is complete without a trip on the Shotover river and while many tourists opt for a rafting tour, Jet boating with Shotover Jet is a much better idea. Shotover Jet definitely has a huge marketing team and has been featured in many international publications including most leading British and American news websites. With that said it’s definitely an iconic attraction and the prices show. An adult ticket costs $149 and kids are $79. You’ll get an expert driver that will put his state-of-the-art Big Red Jet Boat through its paces. At 85kph he’ll skillfully whip the powerful boat past rocky outcrops, skim around crags and boulders, and speed through the dramatic and narrow canyons. Rock faces blur in your peripheral vision and the water sprays into a myriad of white water crystals with every turn. If you’re looking for an action packed 30 minutes of fun then you should add a stop at the Shotover to your next Queenstown adventure. From time to time they do hit a rock or two but that’s all part of the experience! Why: Best Queenstown Jet Boat Tour | Contact: +64 3 442 8570. If you’re looking for something more scenic but with the same great thrills including the legendary huka spin (360 degrees) of nail biting action then Huka Jet is the company to go with. There are officially the only company (since 1990) that is allowed to take visitors up river to Huka Falls (a landmark in the area) that’s definitely worth a visit on dry land too. Owned by the same company behind Shotover Jet you’ll get 30 minutes of fun. Unlike Shotover the banks of the river aren’t lined with sharp rocks and over hanging trees so it doesn’t feel anywhere near as fast or as exhilarating. Regardless Huka Falls Jet is a great family day out with prices starting at $129 for adults and $89 for kids. You can buy a video of your tour for an additional $19. Why: Explore Huka Falls. Contact: +64 7 374 8572. Most tourists start their tour of New Zealand in the largest city so it was no surprise that someone decided to start a jet boat tour operating from Auckland Harbour. Located at Pier 3A in downtown Auckland, next to the historic ferry terminal is a purpose built jet boat platform capable where you’ll board your 24 seater boat for a 30 minute trip around the harbour. Weather permitting this is a great tour to explore the local sights from the water. You’ll see an abundance of wildlife and might even catch some Orca or dolphins that frequent the area. Prices start at $98 for adults and $58 for kids making it one of the more affordable jet boat tours in the country. Unfortunately jet boating in the open water doesn’t feel anywhere near as fast though. Why: Auckland City Jet Boating | Contact: +64 21 379 155. If you’re looking for a thrill then Rapids Jet gets my vote hands down, it’s one of a kind taking you up river to grade 3 and 4 rapids. At $115 for an adult it’s reasonably priced. If you’re heading to Queenstown then I’d recommend Shotover Jet, it’s a popular option among travelers and you won’t be disappointed.